Think old school power....think names like Orion, Precision Power and Rockford Fosgate. 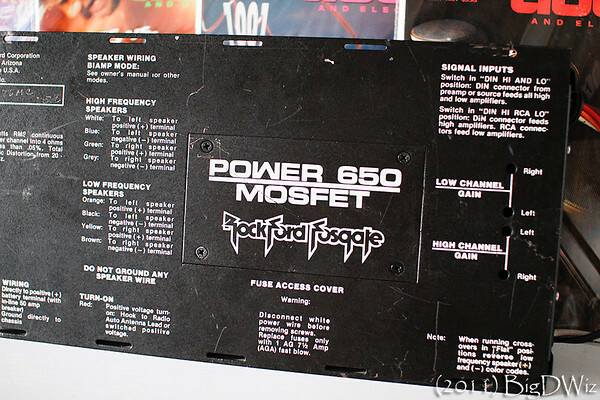 Up for review today is a late 80's Rockford Fosgate Power 650 Mosfet. This amp is an icon of the infamous Mosfet Power series by Rockford. People know the Power 300 as the "entry level" power series amp (MSRP $999*) and the "ultimate" power series as the Power 1000 Mosfet (MSRP $2650*). But why no respect for the big brother, Power 650? It's always tough to be the middle child! The Power 650 retailed for $1575* in 1990 and was available from approximately 1985-1993. 4 Ohms: 125 watts per channel continuous power into 4 Ohms, 4 channels driven, from 20 to 20,000Hz, with less than 0.05% THD + N (Total Harmonic Distortion & Noise). 2 Ohms: 162.5 watts per channel continuous power into 2 Ohms, 4 channels driven, from 20 to 20,000Hz, with less than 0.1% THD + N.
Power Ratings: 2 Channel (bridged) 4 Ohms: 325 watts per channel continuous power into 4 Ohms, 2 channels driven, from 20 to 20,000Hz, with less than 0.05% THD + N.
Bandwidth: 15 to 20,000Hz, ± 3dB. Damping Factor: greater than 200 at 50Hz. Slew Factor: greater than 2.5. Slew Rate: greater than 10 volts per microsecond. Protection: The Punch also employs thermal switches which protect the amplifier from overheating damage. Fuses are provided for speakers which are directly connected with no crossover components. Dimensions: 18 3/10” long x 8 1/10” wide x 2” high, exclusive of knobs and wiring. 19 3/10” long x 8 1/10” wide x 2%” high, minimum mounting requirements. You young kids out there don't know much about Class A/B subwoofer amps with the $300 1500-watt Class D amps you have today. The Power 650 and Power 1000 were classic subwoofer amps in their day. Instead of using DVC subs with "fat" surrounds, we had 15's, 18's and even 30" subs (See Wayne Harris' 1985 Terminator Hearse)!!! No mention these old school subs in many cases were 8 ohms, used in multiples and had an x-max of 10 or 12mm if you were lucky...We still appreciate the "Made in the USA" quality of these amps and the pride the workers put in each and every amp. Shoot, the Rockford amps were even smacked with a rubber mallet to ensure they could handle the "punch" as part of their QA process! One feature lacking on the Power 650 you would find on the Power 300 was bass and treble controls. For the most part, if you could afford a Power 650, you could most likely also afford a matching "Z or ZX" preamp. These preamps had EQ adjustments and even fancy LED lights as a VU meter. In addition to being a powerful four-channel amplifier, the Power 650 is also a very flexible amp. 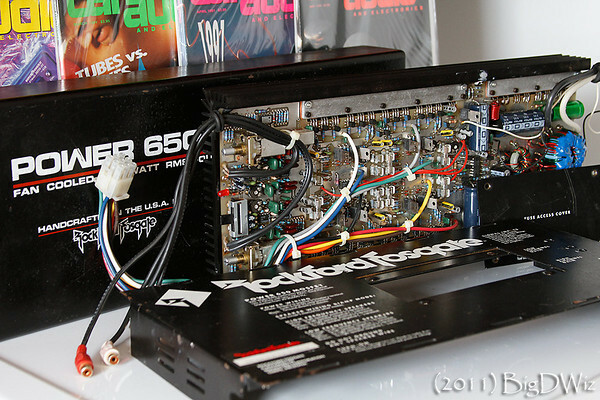 In the mid to late 1980's there were only a handful of amplifiers with built in crossovers...the Power 650 being one. 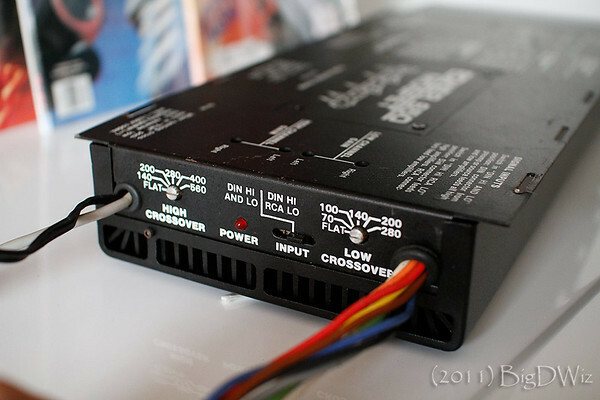 Unlike modern amps, the crossover settings are set at certain frequencies (instead of being fully-variable). Also, note the high crossover's cutoff begins at 140Hz, whereas the low pass could be set as low as 70Hz. It could be used in four, three or two channel operation. My initial RMS wattage tests have shown the Power 650 ratings to be conservative, more on this in an upcoming video and article. 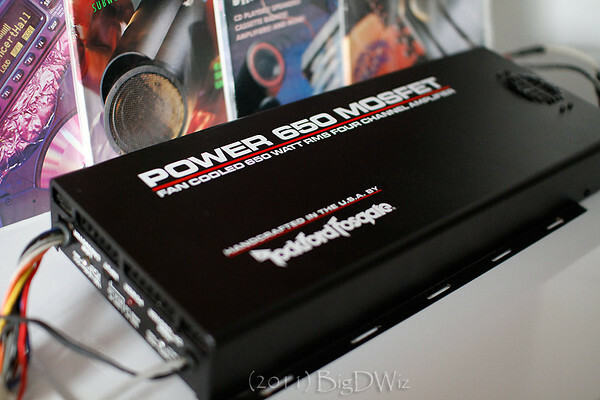 Stay tuned for the RMS wattage output demo of the Rockford Fosgate Power 650 Mosfet. Make sure to Subscribe to my YouTube Channel to stay updated of my latest videos. You can also follow me on Twitter @oldschoolstereo. I always say that 80% of all amplfiers today that claim 1000 watts is pure rubbish because I have heard olschool systems that are just 100 watts that pound like crazy. Systems today are just a bunch of lies.